It’s that time of year when college students are getting ready to spread their wings and mom and dad are breaking out the tissues. 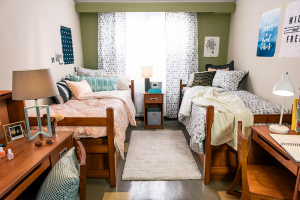 While the empty bedroom at home is sure to bring a flood of emotions to parents, making a dorm room a “home away from home” will likely help everyone feel better about the transition. 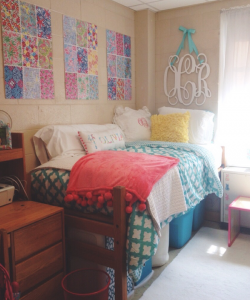 Dorm rooms are notorious for their lack of storage and character, but if viewed as a blank canvas, it gives plenty of opportunity to exercise creativity and personality. 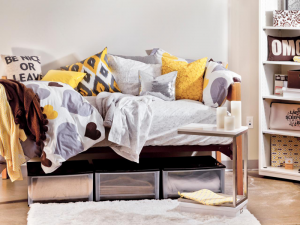 Below we’ve listed the ABCs of dorm room décor and storage, helping you maximize your space and create an environment that is both welcoming and efficient. Area rugs add warmth, soundproofing, and color to an otherwise austere space. Check clearance bins for good deals that won’t break the bank! Bed sheets can be used as a tapestry if you can’t find or afford what you want. Consider personalizing it by buying a white sheet and painting, stenciling, or tie-dying your own design. Clear storage bins, whether tucked under the bed or stacked beside it, will enable you to quickly find what you are looking for. Double-duty is the key to maximizing your space … a small stool can be used as a bedside table or plant stand and also as extra seating. A two-drawer filing cabinet can be used as an end table or wheeled elsewhere in the room for use as a small table. Easy and inexpensive wall décor can be created with scrapbook paper. This comes in a vast variety of sizes and patterns, which can dress up a bare wall on its own or be used as a background for photographs or other pictures. Febreze CAR air fresheners can be clipped to the vent in your room to keep it smelling good! Grab inexpensive scarves and use them for splashes of color … tie one around a plain pillow or use them as a valance arranged around a spring or tension rod. Hang a white board on the inside of the door to leave notes for your roommate or reminders of things-to-do. Invest in a bedskirt caddy. These blend in with your bedding, take up no extra space, and keep water bottles, eye glasses, magazines, and remote controls at your fingertips. Jars can be painted and decorated to collect pens & pencils, jewelry, or silverware. Keep a collapsible chair or two tucked into a corner or under your bed. These are great for visitors and can also be used for outdoor events. Large pillows or a “husband pillow” will make studying in bed more comfortable. These can also be tossed on the floor for extra seating when friends are hanging out in your room. Make your own wall art by printing beautiful on-line pieces onto cardstock. Inexpensive to print and easy to switch out! Neutral colors like black, white, and gray will give your room a more streamlined look and cut down on the cluttered feel. Add pops of color through pillows and rugs, which are easier to switch out or coordinate with a roommate’s items. Ottomans can serve dual purposes if you purchase the lidded kind … storage and seating all-in-one! Plastic containers with lids are great for food storage and keep any unwanted creatures from getting into your snacks. Quick fixes for emergencies should all be stored in one place. A plastic or metal caddy will easily slide under the bed, and it’s a great way to keep Clorox wipes, a stain stick, paper towels, a lint roller, and Band-Aids all in one spot. Spring rods are a great way to hang curtains or other items without making any holes in the walls. They can also be used to create an extra row for hanging clothing in your closet. Thrift stores are your friend! Use planters or canisters for both décor and storage, and spray paint them to match your room. Use a pocket organizer for more than just shoes. 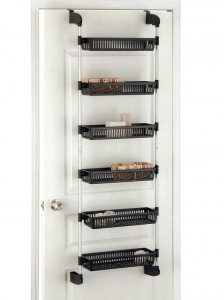 Hang it over a closet door and tuck underwear, socks, T-shirts, snacks, and hair accessories into the cubbies. Visibility is the key for those items you need to grab quickly … a small tray will hold loose change, keys, or ID without taking up much space. Washi tape can be used to decorate your door, create picture frames, or line the edges of shelves … easy to hang, easy to remove. It can also be used to organize your plugs and differentiate between you and your roommate’s devices. XL sheets are necessary for many college dorm mattresses. Make sure your mattress pad and coverlet will fit as well. You can use cork trivets for more than beverages! Paint them as wall art and attach them with adhesive tape, or use them as a background for pictures displayed on your wall. Zippered Ikea shopping bags can be purchased on-line. These are great for move-in day, collecting laundry, and packing to return home. Best of all, they fold and store easily. Make dorm room décor and storage a challenge to be met rather than a frustration to be endured. Students will adjust more easily and parents will have peace of mind if the room is functional, attractive, and homey. These years go quickly, so enjoy each step of the process!